Last week a jury awarded Apple $1.05bn (£644m) damages from Samsung after finding it had infringed several of Apple's design and software patents. 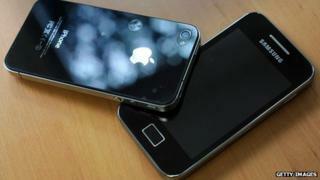 The jury rejected the South Korean firm's counterclaims that the iPhone-maker had failed to license its technologies. The final ruling in the case is still to come - in theory the judge could triple the size of the payment since the jury said Samsung's actions had been "wilful". In addition Apple is seeking a sales ban on eight of the handsets involved in the case. Others are no longer on sale after being superseded with models not included in the lawsuit. The verdict has proved hugely controversial. Samsung plans to appeal, and has warned that customers face "fewer choices, less innovation, and potentially higher prices" if it fails. For its part Apple has said the lawsuit was about values, and the verdict sent "a loud and clear message that stealing isn't right". The BBC asked four tech experts based in the US, UK and South Korea for their views. Carolina Milanesi, a US-based analyst for Gartner, thinks that the verdict is a big victory for Apple, and acts as a warning to other smart device makers. The impact on Samsung's sales in North America won't be dramatic - most of the devices found infringing are older models now. If you look at all the comments on the decision there are two camps - will it stop innovation or will it push innovation further. I think the latter; vendors will be pushed to be more varied, and that's what they needed to do in the first place. We are in a world in which a handful of vendors in the same ecosystem are competing - you need to be innovative, you need to be unique, you need to look at what works for the consumer. For the consumer I don't think it's a loss - why should it be? If you go back to the drawing board and come back with something different the consumer has gained. It was interesting to see that stock for Nokia went up on the back of the news. Does Windows Phone now become an alternative? For a vendor, putting all your eggs in one basket is never a good thing. Jasper Kim, the founder of the Seoul-based Asia-Pacific Global Research Group, says South Koreans may perceive the ruling as unfair because the trial took place in the US - and such sentiment could trigger a patriotic backlash against Apple products. I believe the ruling is not the end of the Apple-Samsung lawsuit war; instead it may be the beginning. In the past, Apple was identified less as an American company, and more as a technology giant - but that may soon change. What Apple risks is an anti-Apple, anti-US double backlash effect in a country that has surprisingly been fond of Apple products. I say surprisingly because the rapid rise in popularity of iPhones and iPads happened in Samsung's own backyard. An anti-Apple sentiment could undo all of that and negatively affect sales of the next edition iPhone here. Samsung may also request that certain Apple products be banned in South Korea in the future. At the same time, the South Korean firm can in theory appeal at least two more times against the US ruling; to the US appellate court and then to the US Supreme Court. So while the judgement has shifted the momentum of the legal tussle between the two rivals significantly towards Apple, the celebrations may need to to wait for a while. Apple has won the battle, but it has yet to win the legal war against Samsung. Zack Whittaker, a UK-based contributor to tech site ZDNet, believes that the biggest loser following the ruling is the consumer. Steve Jobs may have declared "thermonuclear war" against Android, but it was Tim Cook who led Apple into battle. For now, this ruling is Cook's legacy in just over a year since taking the chief executive's chair. Despite the court ruling in Apple's favour, and Samsung's financial bruising, it will be the end-user on the street who is likely to suffer the most. Samsung claims consumer choices could be restricted by the ruling - we have yet to see in practical terms exactly how this will play out - but it's the consumer that may have to pay a premium for the privilege of using a rival product to Apple's iPhone. Much of the focus has been on Apple and Samsung, rather than who actually benefits from the ruling. Microsoft escaped entirely with its unique user interface, as has RIM's Blackberry handset. By potentially clipping Android's wings, we could see an albeit modest revival from these once-strong brands. Stuart Miles, founder and editor of the UK's Pocket-lint gadget site, believes that in the long run consumers should benefit as Samsung will become more innovative. A lot of people believe the patent system is flawed, but people who create things need to protect those patents. Apple has been able to protect its patents - the outcome is that Samsung has wilfully infringed them, been caught doing it by the jury and therefore supposedly punished for doing so. If you look at early days of Samsung mobile devices, a lot of people bought them because they didn't like the iPhone any more but wanted "iPhone-sque" experiences. Samsung's Galaxy S3 is a very different device to the iPhone, and in general Samsung has moved away from designs that are similar to Apple's. We've moved to phones now that are basically a rectangular shiny piece of glass because the touchscreen dominates the design. How do you create a rectangular, shiny piece of glass that's different from another rectangular, shiny piece of glass? In the short term, Apple is obviously going to try to ban as many infringing products as possible - they would be stupid not to. But I can still go out and buy any Samsung product today. That's the problem with patents - it's exciting from a news perspective but consumers don't really notice much difference. Samsung will now work fast - the Galaxy S3 came out in May 2012 and you'll have a new one in 2013 - so today there'll be no effect. In three months, you might be limited on buying some devices, but some may have been superseded anyway. I think in six months you'll see some aspects of the phone from Samsung changing slightly to make sure they don't infringe patents going forward. But Google has said no core elements [of its Android system] have been infringed on, so Samsung will just tweak some elements of its operating system... and the world will continue on.